The first Africans arrived in English North America on a ship called the White Lion. The journey brought them to Point Comfort where the city of Hampton now sits. HAMPTON, Va. — In 1619, the first Africans arrived in English North America. They came ashore at Point Comfort where present-day Hampton, Virginia sits. There were about 20 Africans in the group. English settler John Rolfe documented their presence by referring to them as "20 and odd Negroes." As we mark the 400th anniversary of their arrival, 13News Now goes inside the story of the first Africans in the New World. It's an American story that few people truly have heard. 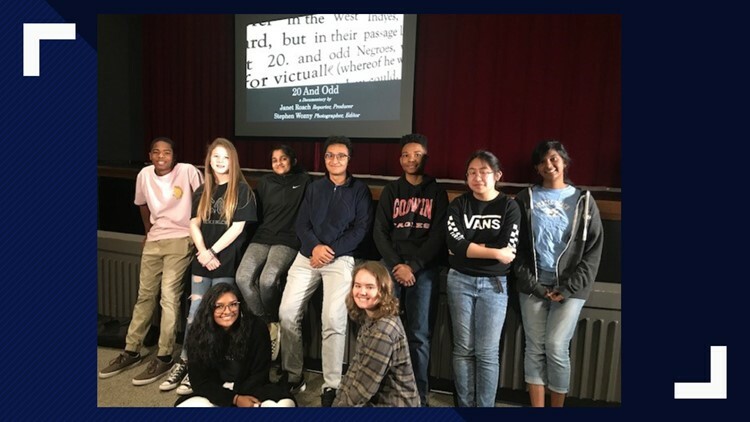 The tenth graders and one senior at Mills Godwin High School in Richmond invited 13News Now to share the 13News Now documentary, "20 and Odd:" Africans' Arrival in 1619 with the class so they could learn more. "Over the years in social studies since elementary school, we talked about it, but really not much in detail," said student Abhishek KulKarni. The students said they are familiar with famous 17th-century historical names including Pocahontas and John Rolfe, but the first Africans are nameless. "The documentary, it finally started to give you names to some of the African Americans who first arrived," said student Shrinidhi Nadgouda. The students who shared their views on the subject were sophomores, Mykel Brooks, Jordan Austin, Shrinidhi Nadgouda, Abhishek KulKarni. Tracey Dews, Patricia Mutia, Esha Sharma, Serena Grant and senior, Dalia Jamenez. Join us on 13News Now at 11 p.m. February 5 to February 7 as we begin to trace the arrival of the first Africans. Then, be sure to tune in Friday, February 8 at 3:30 p.m. for our documentary "20 and Odd:" Africans' Arrival in 1619.